Get ready for the pop concert of a lifetime! 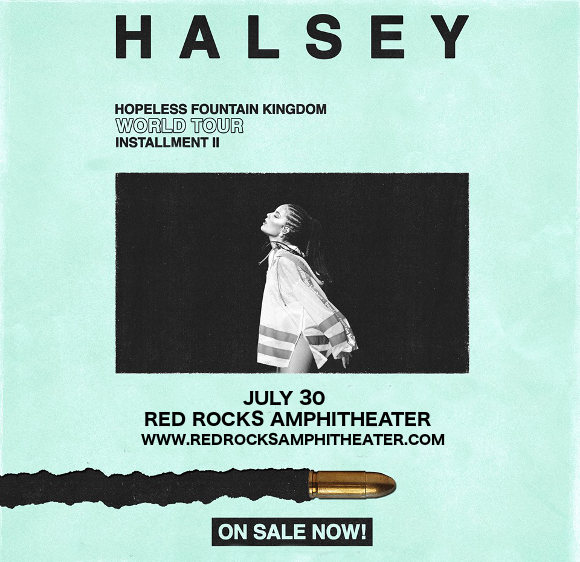 That’s right, on Monday 30th July 2018, the amazing Halsey will headline the Red Rocks Amphitheater!! Get ready to catch the “Bad At Love,” singer live – tickets on sale NOW and selling fast, so don’t delay!! Grab yours NOW while they last! Catching the attention of major labels with her self-released material, Halsey, the stage name of Ashley Nicolette Frangipane, was signed to Astralwerks in 2014, and released her first album, “Badlands,” one year later, to widespread critical claim and massive sales, earning the singer Platinum certification by the RIAA! Her success rose further when she collaborated with The Chainsmokers on the song “Closer.” Now, she’s on tour with 2017’s “Hopeless Fountain Kingdom,” her first album to top the Billboard 200!! And with good reason – the album was widely well-received by critics, with Rolling Stone magazine describing it as "her sprawling science-fiction breakup tale, indulging her taste for wide-screen melodrama,” that "shows off all her wild musical ambitions”. The young star has earned a reputation for owning her live shows by occupying the massive space entirely with her own powerful performance, without needing to rely on backing dancers or other distractions to keep her audience entertained. Get ready to experience it all for yourself on July 30th – the era of the “Hopeless Fountain Kingdom,” has only just begun! !